Nylon Chassis Cable Ties | Chassis Zip Ties | Cal Fasteners, Inc.
Chassis cable ties are designed to quickly and securely attach bundles to a vehicle chassis or other similar structures. They are ideal for automotive, truck, and heavy equipment applications. 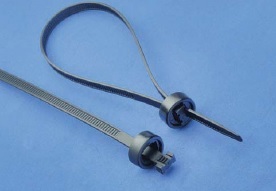 Cal Fasteners stocks 30-pound capacity chassis cable ties manufactured from high quality black nylon. These chassis cable ties feature 2-sided straps that can be inserted into the head in either direction for easy installation. Special pawl and teeth designs provide increased holding strength. ROHS compliant. Request a quote on chassis cable ties for your application, or contact Cal Fasteners to learn more.